Per the recommendation of the hostess at Stella I made my way over to HERBSAINT restaurant just a few lovely blocks from the Loews hotel where I'm staying. Had a cocktail and waited for a bar seat to open. This place had an amazing vibe. A great mix of locals and foodies all gathering in a mecca of sorts on this quiet New Orleans street. 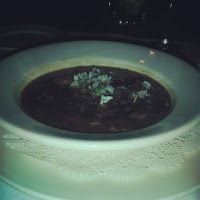 I started with the chicken gumbo and it is by far the best gumbo I've ever had. Smokey and rich with just enough spice to make you smile it was perfect an one of the best dishes ever. For the main course I ordered something that I always have to try when it's on a menu: Mr Pork Belly If I were ever a crackhead my crack would involve pork belly in some shape or form. The belly came resting on a bed of a toasted lotus leaf on sticky rice. On top we had some tomatoes, cucumbers and a few chopped mint leaves. The mint made all of the difference on this dish. It complimented the melt in your mouth pork in a ballet of flavors. Every bite would make my taste buds explode with the fresh sea salt and then the hint of mint would bring me back to earth. Like any true foodie I went to a different place for dessert: Emeril's New Orleans. Every food or cooking show on the planet has mentioned Emeril's banana cream pie and stressed the amazingness of it. They were not lying. Holy Sh******************t that was good. When I saw the waitress bringing the plate I could have sworn she brought a banana cream Flatiron Building . Nevertheless, I dug into the trenches and fought my way against this Leviathan. Twas a long fought bottle but @TheYumYumFoodie came out as the champion. That pie is a "Must Have" when you make your way to NOLA. Now time for bed and my food coma.